The Telluride Ski Resort rises from the Valley Floor directly north of Telluride, offering steep slopes where you can ski right into town in the winter and pedal through pine forests in the summer. Boomerang/Jurassic/Meadows is a fast and convenient link-up that offers the best and flowiest downhill section on the ridge. Jurassic/Meadows definitely represent the sweeter half of the ride. The trails, which begin at the top of the ridge, undulate through the trees in a nice rhythm as they make their way down. But to get to the Jurassic trailhead, you’ve got to gain the altitude. That’s where Boomerang comes in. Boomerang is the suffering before the reward. It’s a short but brutal climb up a rocky double-track that will make you hate life a little before you get to the fun stuff. Riders who don’t like to suffer can also cop out and ride the Gondola up. Boomerang forces you to focus, gets your heart clanging and leaves you with the satisfying feeling of working hard. Jurassic/Meadows is pure, sweet, fun downhill. The link-up is convenient and can be done in about an hour. Cross-country riders who like a little bit of suffering with a payoff. Cyclists who are looking for a lunchtime or quick post-work ride. It’s free and dog-friendly. 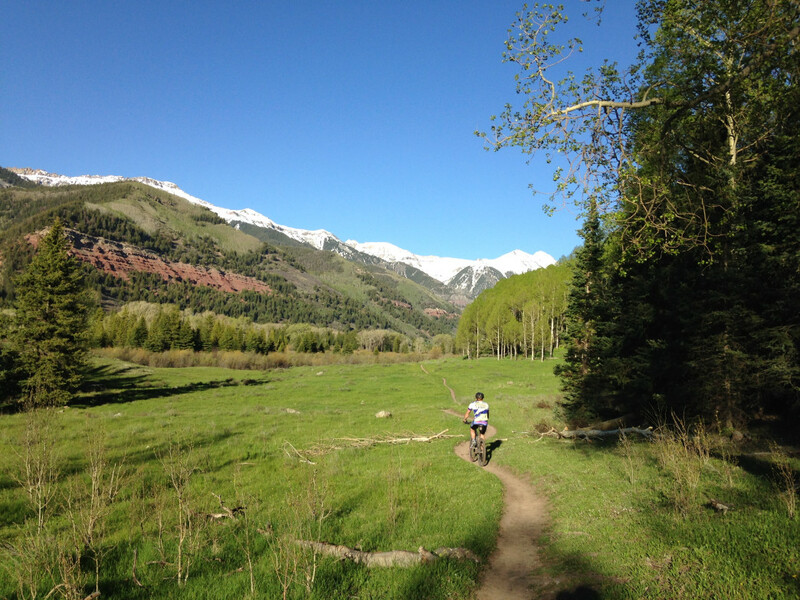 Pick up the River Trail, a wide dirt path that follows the San Miguel River, in town: at the entrance to Telluride Town Park, at the Pine Street Bridge or even at the gondola station. Head right, follow it as it crossed Mahoney Drive at the end of town and pick the trail back up across the street on the left side of the river. Keep pedaling, following the path as it traces the river. Stop when you see the large bridge on the right. To your left will be Boomerang. Climb that beast, and when you top out you’ll see the Jurassic trailhead on your right. Head down this path, flow through the trees, and when the trail spits you out in a residential area, hop on the main paved road for less than a mile until you see a sign and trailhead for the Meadows Trail on your right. Take this trail, another fun downhill, until you hit Highway 145. Cross the highway and catch another singletrack, which will drop you down through the Lawson Hill residential area. Ride through the tunnel at the bottom, and the trail will take you to the beginning of the Goose. Take a right onto the faint singletrack here to get to link back to the Valley Floor, taking the bike path tunnel under the highway. From here, take a right to get back on the Valley Floor singletrack (go through the gate in the parking lot) for a dirt option home.